Update: some people have pointed out that they prefer the method of disabling the specific virtual paths in episerver.config. See the end of this blog post for more information. 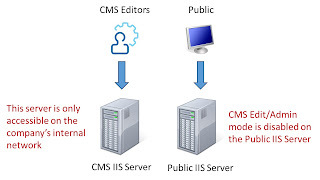 I realize that there have been several other blog posts regarding this topic, but after lots or trial and error I believe I have found a solid approach for disabling CMS edit/admin mode on public facing IIS servers in a load balanced environment. There are other techniques that can be used to secure CMS edit/admin modes in a single server environment. Check out this blog post by David Knipe for additional information. It essentially uses IP white lists at the IIS level. Maintaining IP whitelists can be problematic, so I prefer having a dedicated CMS server that's only accessible within the internal network. In my last blog post we covered how to setup EPiServer load balancing using net.tcp. We also detailed the three basic models that can be used when implementing EPiServer load balancing. Today we'll be focusing on the Security model. 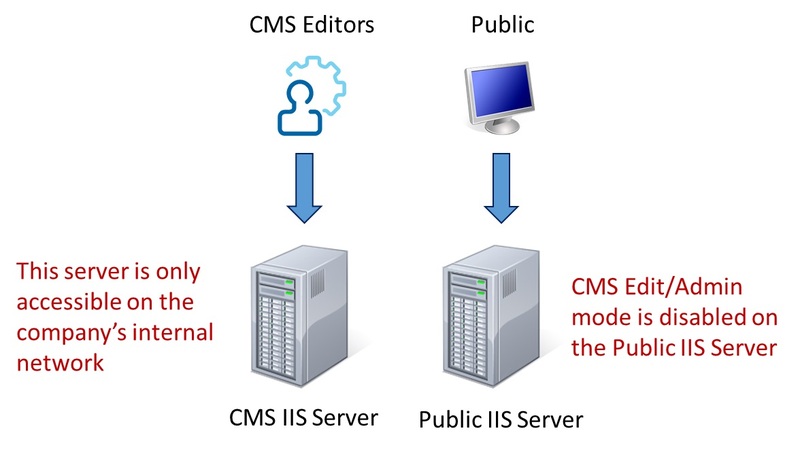 To recap, the security model provides a dedicated server for CMS editors to connect to and make changes to CMS content. This server is normally only accessible from within the company's internal network. The one or more "public facing" servers are what the general public connects to. These "public facing" servers have the CMS edit/admin mode completely disabled. http://cms.mysite.com/episerver would prompt for login, and if the credentials are correct, allow the individual to navigate to CMS edit/admin mode. http://www.mysite.com/episerver would be completely disabled, even if the user managed to steal a CMS editor's credentials. Some of my Swedish colleagues have told me that this sort of setup is not very common in Sweden. But I've personally noticed that many of our clients here in the States prefer having a dedicated CMS editor server. I can't say I blame them. So how do we harden the "public facing" servers. It's remarkably easy. All you have to do is make some tweaks to the Web.config file on the public facing server(s). Disclaimer: these instructions work for EPiServer CMS 6 R2, I'm not sure about EPiServer CMS 7, but I believe the premise is essentially the same thing. The idea here is to modify any <location> element in the Web.config which currently requires WebEditors, WebAdmins or Administrators role membership to access. Notice that the <allow> element currently specifies that WebEditors, WebAdmins, and Administrators can access this location. The <deny> elements tells IIS to deny everyone else. All we essentially have to do is remove the <allow> element (comment it out) on the public facing servers and this location will be denied to everyone - including CMS editors/admins. This means even if someone managed to steal the username and password of a CMS editor, they wouldn't be able to login to CMS edit mode unless they were somehow connected to the internal network and knew the URL to the CMS web application instance. Please note: you can easily use Visual Studio transforms to create a Solution Configuration which automatically removes the <allow> element when publishing to the "public facing" servers. We'll take a closer look at transforms in my next blog post. Here we've commented out the <allow> element for the <location path="episerver"> element. You should repeat this step for all <location> objects that currently require WebEditors, WebAdmins, or Adminstrators role membership. 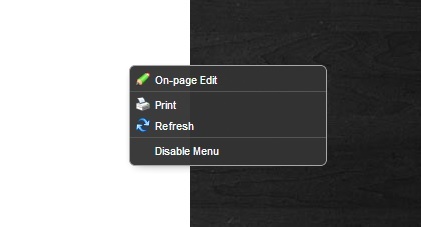 Assuming someone is able to login using CMS editor credentials, they can still access the EPiServer context menu (for on page editing), even if they cannot get to CMS edit/admin mode. This is because the <location> elements don't affect access to the context menu. The context menu is driven by EPiServer ACLs. I stumbled across the solution on this blog post by Paul Houghton. It requires building some code which will disable the EPiServer context menus for all page templates and then using appSettings to control whether or not this code should execute. You could then configure the appSettings in Web.config for the servers where you want to disable the context menu appropriately. Well appSettings was fine and dandy several years ago, but these days we use project level application settings. See this post on Stackoverflow for addition information on the differences between appSettings and application settings. So let's build a boolean application setting for our project in Visual Studio. Now we can add some code in PageBase.cs (which all of our EPiServer templates inherit from) to override the onInit() page life cycle method. This code checks the application settings value and determines if it should enable or disable the EPiServer context menu. The great part about application settings is that the values are compiled into the DLL, but can be overriden via the Web.config. If you don't supply a value in Web.config, the compiled in value is used. Pretty cool huh? So now all we have to do is override the "True" value for our EnableEPiContextMenu in the Web.config on our public facing servers. If your site literally does not require any sort of login functionality for the general public you can further secure your "public facing" severs by disabling the login page completely. You would keep the login page for the CMS server so that your CMS editors can login. IIS determines the user is going to a location path that requires login. IIS tries to respond with the login page defined in the <forms> element in Web.config. IIS can't find the login page and therefore returns a 404. If you are using the standard EPiServer login page, you can comment out this line in episerver.config. This disables the virtual path to "~/Util" where the EPiServer login page is stored. If you are using a custom login page, just remove it from the build you publish to your "public" facing servers. That about does it folks. Tune in next time for how to use Visual Studio transforms to easily customize Visual Studio publish configurations. This allows you to make configuration changes automatically when publishing builds of your web application to different servers: DEV, TEST, CMS, and PROD. Update: As others have pointed out, another approach you can use is to remove the relevant virtual paths in episerver.config. This approach will return a 404 when trying to access a resource that you don't want the general public to have access to. This is because IIS literally can't find the resources (you disconnect the virtual link that points to the C:\Program Files\ directory on the file system). I like the <location> element approach I outlined above works directly with IIS security, and I find it very simple to implement because it's easy to identify which <location> elements to modify. But this approach is "closer to the metal" in that a malicious individual literally is unable to access the appropriate resources from the file system. To implement the episerver.config virtual path approach, simply comment out the relevant virtual paths in episerver.config. Now, I haven't tried this out myself, but can't you simply *remove* all the elements that are related to Edit/admin mode? To me it makes no sense to add a bunch of handlers and settings to a location nobody can access anyways. arvesystad: Yes you can remove all VPPs in episerver.config that relates to edit and admin mode. But that said, I would also recommend denying all requests to '/episerver/', or what your ui url is. If you remove the elements (And probably all VPP's for them as well, as you say) for all Episerver-locations on the "front end server", any requests to "/episerver/" will simply look for a normal page with that URL and give you a 404, which would - in my opinion - be a far more correct way to do this. Handing back an access denied-response implies that there is something there, which it in effect should not be. That's a really good point. In fact one of the other blog posts I came across preferred using the method you describe (removing all the associated VPPs in episerver.config). You'll notice that I do use that technique when I describe disabling the built in EPiServer login page. You could do this in addition for extra security, but in my opinion you should also be using IIS to enforce security. I'll update the blog post with a note on this.